Tamaflex Reviews - Is it a Scam or Legit? Tamaflex is a series of three different types of turmeric supplements from nutrition store GNC that claim to relieve joint pain and stiffness and increase joint mobility. Tamaflex is a tamarind and turmeric supplement sold by GNC that claims to provide relief to joint pain. GNC says that studies show that people who take Tamflex may see significant improvements in knee-joint range-of-motion, joint comfort, joint function and joint stiffness. The nutrition store offers three different supplements that include Tamaflex: Fast-Acting, Complete and Tamaflex. Each one of these options has slightly different ingredients but all of them include the proprietary Tamaflex blend of tamarind and turmeric. In this review, we’ll give you a quick overview of what each supplement does, what its ingredients are and what science says about the effectiveness of tamarind and turmeric in relieving joint pain. As we mentioned a few seconds ago, GNC gives you three types of Tamaflex from which you can choose: Tamaflex Complete, Tamaflex Acting and Tamaflex. In the following sections, we’ll discuss each supplements dosing, ingredients and the research behind the non-Tamaflex ingredients. After these sections, we’ll talk about the science behind tamarind and turmeric. Pro tip: All three supplements contain 125mg of the Tamaflex tamarind/turmeric mixture. This bottle of supplements has 120 pills. Directions for the bottle say that you should take two in the morning and two at night, meaning one bottle is good for 30 days. They derive this conclusion from the fact that the five ingredients we listed above have links to the building blocks of cartilage and pain relief. We searched WebMD’s supplement guide and found that there is, in general, insufficient evidence to prove that d-Glucosamine, chondroitin, and type-II collagen are effective in relieving joint pain and improving function. The site notes that hyaluronic acid could “possibly” be effective for easing osteoarthritis pain but only by injection straight into the joint. This supplement contains 60 capsules that you take once in the morning and once at night, resulting in enough capsules to last you one month. We could not find the study GNC referenced but we did discover that the ingredient is produced in India by a company called Laila Nutra. What we do know is that WebMD notes that ApresFlex can help osteoporosis sufferers. The site goes on to say that the ingredient’s effect on rheumatoid arthritis does not have sufficient evidence. The final supplement GNC offers under the Tamaflex line is simply known as Tamaflex. One bottle contains 60 capsules that you take once in the morning and once at night. This pill’s main ingredient is Tamaflex, the proprietary combination of tamarind and turmeric we mentioned earlier. How Effective Are Tamarind and Turmeric in Relieving Joint Pain? HighYa reporter Alicia Doyle did an in-depth examination of turmeric in her guide to turmeric and curcumin. In her analysis of these two ingredients, she talked with New York-based doctor Laura Levy. Levy told us that turmeric been used in Eastern medicine for a long time and can help with inflammation, menstrual cramps, post-operative pain, indigestion and weight loss. Based on the various studies and evidence we’ve analyzed, there isn’t conclusive proof that turmeric can help with general joint pain and movement, a fact that WebMD confirms in their list of the uses of turmeric. At the time of publishing, GNC was offering a buy one, get one 50% off deal as well as free shipping on orders of more than $49. You also have the option of choosing GNC’s Auto-Deliver & Save program, through which they’ll send you a new bottle of Tamaflex on a regular basis at a 10% discount while giving your free shipping. If you choose this option, you’ll be able to select the frequency with which GNC sends the product. In the case of Tamaflex, one bottle is good for 30 days, so make sure you sign up for a monthly delivery. GNC includes Tamaflex in its 30-day money-back guarantee. According to their website, you have 30 days from your order date to get a refund of the product’s purchase price if you aren’t satisfied with how it works. Keep in mind that you’ll have to contact GNC first to start the return and they’ll expect you to return the product in “good condition” and in its original box if you can. Your Tamaflex will come with specific instructions on how to make a return. Once your return is ready to go, you’ll send it to the following address: GNC; 5215 Albert S. White Blvd. ; Whitestown, IN; 46075; Attn: Return Department. All the research we’ve read indicates that there’s a possibility that Tamaflex can help you with joint pain. However, the most definitive research is linked to ApresFlex, the Boswellia serrata ingredient included in Tamaflex complete. As we mentioned earlier, there is some evidence that the ingredient can help with joint pain that results from osteoarthritis. However, keep in mind that just because the ingredient helps in those situations doesn’t mean it’s guaranteed to work in your situation. This isn’t a statement about Tamaflex as it is about supplements in general. Effectiveness in one study may not guarantee effectiveness in your daily life. In terms of price, Tamaflex is on the cheaper side of supplements that contain turmeric. Ultra Pure Turmeric costs $69 per bottle for a one-month supply and $44 per bottle for a four-month supply. A one-month supply of Synchro Gold is around $58 if you take one serving a day and twice that if you take two servings a day. It’s important to note, though, that both Ultra Pure Turmeric and Synchro Gold contain more turmeric per serving (600 mg and 500 mg, respectively) than Tamaflex, whose 125mg dose is a mixture of tamarind and turmeric, so it’s hard to say exactly how much turmeric is in one serving. In general, we believe that other turmeric supplements provide a better value simply because they contain more turmeric than Tamaflex. However, Tamaflex Complete has the upper hand when it comes to Boswellia serrata. Our final reminder is to pay close attention to how your body responds to Tamaflex. While the research we’ve read from WebMD and other sources note that turmeric is safe for consumption, side effects are possible and may include an upset stomach, nausea, diarrhea or dizziness. I had to live with extreme pain in my knees and my shoulders and my wrist from all the injuries from my years as a Marine sniper. I've tried several things and nothing seems to work. One day the GNC, they suggested Tamaflex. It's been the first time I felt a little bit of relief, all the painkillers in the world do not help, but Tamaflex has the edge and I can work. I still feel it, but it's bearable and you can imagine that Marines have a very high pain tolerance, so for me to say it hurts it is very bad for a man that has set his own broken bone in his arm during the war in combat. Tamaflex really works. Important to note - an error in the review posts the Boswellia extract is only offered in the TamaFlex Complete. IT IS NOT! It is included in the TamaFlex Fast Acting product, not the Complete. That said, I am an active 65-year old man who suffers from Bursitis-related hip pain, enough pain to wake me up at night. After taking the Fast Acting TamaFlex for only 24 hours (two capsules), I estimate a 50% reduction in my pain. While not a "clinical trial," I am hopeful and will report back. I started using Tamaflex Fast Acting about two weeks ago. After receiving a second cortisone injection about a month prior, my hip pain was becoming severe. I noticed the pains were more severe later in the day and into the night. Motrin was not helping. I researched anti-inflammatory products. 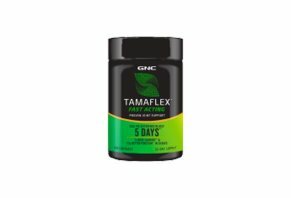 I talked with a sales rep at my local GNC, he recommended Tamaflex. I started the supplement on a Tuesday after a day of severe pain. I noticed benefits within a few days, by Friday, I had very little discomfort. I went away for the weekend and performed normal activities with no discomfort. It has been 3 weeks since I started taking Tamaflex. It has really reduced discomfort. Sitting for a long time will still produce some hip stiffness, but it goes away after a few minutes of standing and walking. I have had no prolonged discomfort since taking the product. I have recommended it to friends and family. Write a Review for Tamaflex!